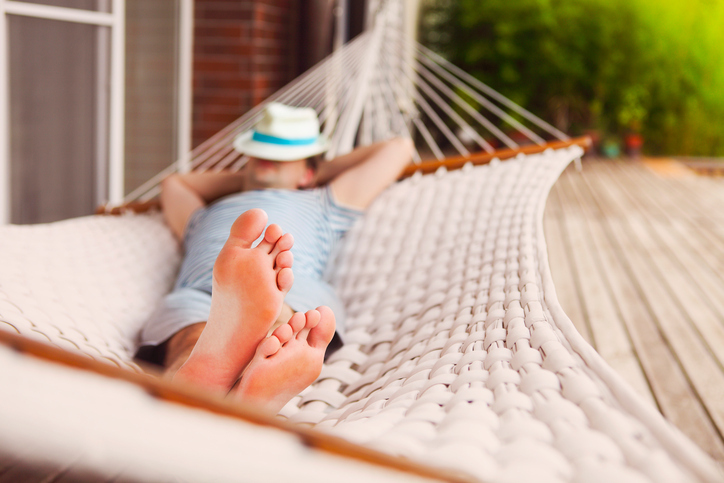 To nap means ‘to sleep for a short period of time,’ especially during the daytime. Figuratively, it means ‘to be off your guard.’ As a noun, a nap is a short period of sleep. Unrelatedly, a nap is the raised fuzzy end of fibers on the surface of cloth and the verb to nap means ‘to raise the nap.’ Nap is also used as a shortened version of kidnap, combined with other words to mean ‘abduct or steal in order to collect a ransom,’ in words like ‘artnap’ or ‘petnap’ for example. Janine likes to nap for an hour after lunch. The goalkeeper must have been napping to miss that easy save. If you're tired, why don't you have a nap? This cloth has a very smooth nap. There are machines in the factory for napping the cloth. Police are investigating reports that several animals have been petnapped in the neighborhood recently. catch someone napping: catch someone off guard. Example: “The question caught the politician napping and he didn’t have an answer.” Of course, this expression can also be used literally to mean ‘to catch someone sleeping.’ If someone says, for example, “The boss came back early from her meeting and caught me napping at my desk,” they almost certainly mean she caught them asleep rather than off guard. nap hand: taken from the shortened version of a card game called napoleon, in US English a nap hand is used figuratively to mean that the person who has one is in a position where there is a good chance of success if a risk is taken. Taking a nap can be very relaxing and refreshing, especially if you have someone to snuggle up to, as you can see in this clip from an episode of Friends. Nap is also short for the card game napoleon, which is similar to whist. You can read more about the game and how to play it by clicking here. Nap dates back to before the year 900. The Old English verb nappian, and later the Middle English verb nappen, meant ‘to doze or sleep lightly.’ Its origin is uncertain, but it is related to the Old High German hnaffezan, the German dialect nafzen and the Norwegian napp, pointing towards a Germanic origin. In this sense, the noun nap comes from the verb, and dates back to around the year 1300. The unrelated noun nap, ‘the fuzzy surface on cloth,’ dates back to the mid-15th century. The late Middle English noppe came into English from the Middle Dutch or Middle Low German noppe, meaning ‘nap’ or ‘tuft of wool,’ and was probably introduced by Flemish cloth workers. It is related to the Old English –hnoppa, a suffix found in some words like wullknoppa (tuft of wool), as well as the Old English verbs hnoppian (to pluck) and ahneopan (to pluck off), the Old Swedish niupa (to pinch), and the Gothic dis-hniupan (to tear), pointing again to a Germanic origin. The verb related to this sense comes from the noun, and dates back to the early 17th century.